Folegandros is a truly magical island, perfect for travelers who don’t mind going the extra mile for a genuine laid-back Greek island experience. There are only two ways to get there, via helicopter or boat, and it’s really reflected in the the mood and pace of the island. I highly recommend a stop here for a few days to anyone island hopping around the Cyclades. Think of it as a vacation within your vacation. 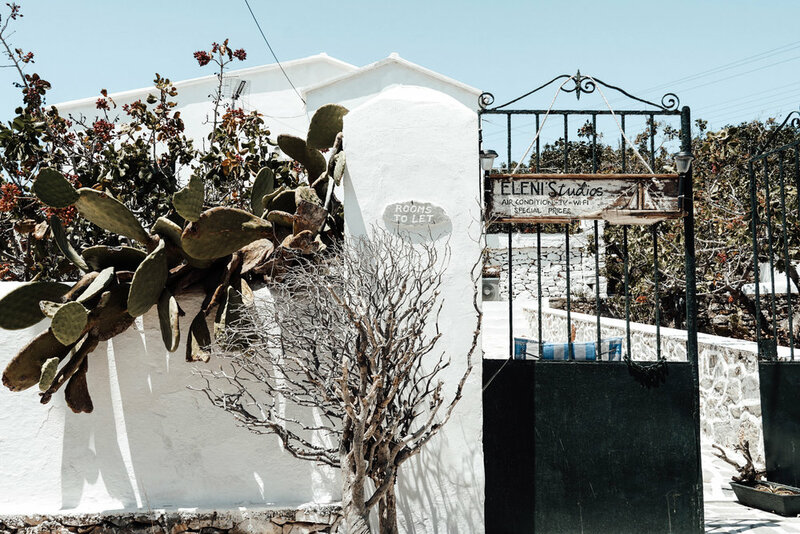 We visited Folegandos between Naxos and Sifnos, but this island makes a convenient stop to other nearby islands like Mykonos, Ios, Paros, Milos, etc. Every hotel on the island was booked when we were there in August, and since there aren’t very many hotels to begin with, the island was at a very comfortable capacity. We stayed in the Port because it was all that was available when we booked a few months before we departed for our trip. Although the Port is lovely, I recommend staying in the Chora. You will be able to walk to most the island’s restaurants, shops, and its few bars each night. The Chora is also the central dispatch location for the island’s bus service. The buses, which are frequent and inexpensive, can take you to the Port and to a few of the island’s beaches. The bus system is a great alternative to renting a car, ATV or moped. One of my favorite things about Folegandros was the hand-painted signs. Every restaurant and shop seemed to have one. When we asked the staff of our hotel where we should eat dinner each night, they asked, “what would you like? Seafood, meat? All of the restaurants in the Chora are good, it just depends on what you want.” It was nice to know that no matter where we ate on the island, we’d be having a delicious and thoughtfully prepared meal. 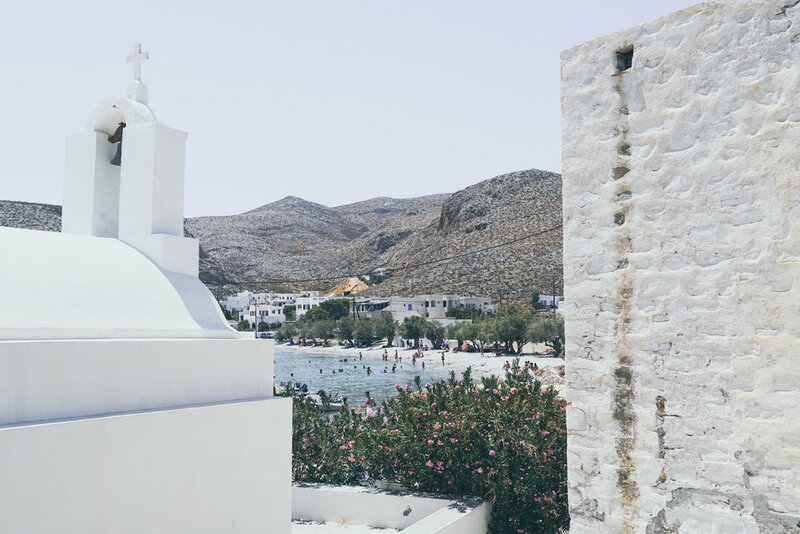 A visit to the Church of Panagia, an iconic landmark of Folegandros, is a well worth the hike. The church is only open in the evenings, from 6 to 9pm. A stop at Thema Chronou (Matter of Time) is worth a moment of your time not only because of their great coffee, but also because of their famous view of the castro (castle). During our time in Folegandros we had one beach day and chose to spend it at Agios Nikolaos beach. It is only accessible by a small boat that will ferry you from Agali beach for the price of ten euros. There are two tavernas on Agios Nikolaos beach, however I highly recommend you bring your own water and snacks. One thing I couldn’t get over is how quiet this island is. I have been traveling throughout Greece since I was 6 years old but, for the first time in a very long time, I felt like time was standing still. I thought THIS is the laidback Greece people travel so far to experience. We’re happy to offer two of our photos of Greece available as wallpaper for your phone. Want more? We’ll be sending new wallpaper out periodically to our email subscribers. This summer I visited the Cycladic island of Naxos for the first time. I was impressed by its diverse architecture, farm-to-table food as well as its unique and storied landscape. I am already looking forward to my next visit there, when I can revisit some of my favorite spots listed below. We made the hike up to the Portara, or Temple of Apollo, one evening to watch the sunset alongside many other tourists. It was a calming experience, and felt like we were witnessing something special. Apostolis quickly became our favorite restaurant in the Chora. We first visited for lunch and later returned for dinner (twice). We tried just about every dish, and everything was delicious. Their Greek salad with Naxian cheese in a bread bowl was an absolute showstopper and left me wondering, why hadn't I thought of that? Tip: Traveling to Naxos in August? You will need to book your dinner reservation at Apostolis one day in advance. 520 Bar is named for the country of origin code for products from Greece, so they won me over before I even stepped foot in the place. It's a great spot to watch the sunset and their cocktails are delicious. The 520 Spritz, their take on an Aperol Spritz, was a light and refreshing aperitivo that kept me coming back each night. Tip: The bar has two levels, be sure to head upstairs for the best view and relaxing lounge area. I know what our American readers are thinking, "Waffle House"? Let me tell you there is absolutely no relation to the American restaurant chain. This Waffle House serves up, I can confidently say, the best ice cream I've ever had in Greece, if not anywhere. They use only ingredients produced in Greece (woo!) and offer the typical flavors you'd find at an ice cream parlor as well as homages to traditional Greek flavors. The Greek yogurt and vissino (sour cherry) flavor was my absolute favorite. They also have a location on Plaka Beach. You're welcome. Our first beach day we headed to Macao Beach Project on Agios Prokopios Beach. This beach is filled with rows and rows of lounge chairs and umbrellas, which is ideal for anyone who’s looking to be in the center of all the action. We spent a day at Tortuga Beach Bar & Restaurant on Plaka Beach, where the upscale yet laidback atmosphere took us back to many of our favorite spots in Mykonos. We soaked up the sun on the quiet beach under a lux canopy, and when it was time for lunch we headed to their restaurant. During my time in Naxos I ate Naxian cheese prepared many different ways, but none can be outdone by Tortuga’s offering (shown above). When slightly salty and soft Naxian cheese is wrapped in kataifi, then fried, and then drizzled with honey and pistachios, something truly magical happens. Early one morning we decided to visit the village of Apeiranthos (a 45 minute drive from the Chora). I was curious to explore this small town since it was featured by the late Anthony Bourdain on his show Parts Unknown. 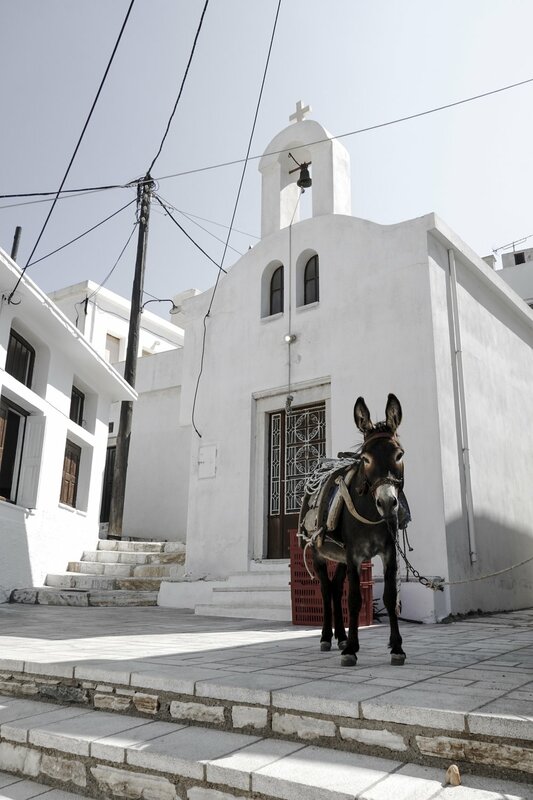 Walking through Apeiranthos gives you sense of what life is truly like a traditional Cycladic village. The village of Halki, which once served as the capitol of Naxos, is a 25 minute drive from the Chora and was an absolute pleasure to visit. The old villas and Venetian towers are now filled with tavernas, coffee shops and stores. We had a delicious lunch at Giannis Taverna where we ordered a traditional Greek salad, briam (mix vegetables baked in tomato sauce) and kontosouvli (chunks of seasoned pork cooked on a rotisserie over a grill). Fish and Olive - A beautiful art gallery who’s porcelain vases and dishware (that are made in-house) are almost too pretty to put to use. Church of Saint George Diasoritis - This Byzantine church which was constructed and decorated in the 11th century and is situated in an olive grove a short walk from the center of the village. Halki has a much different feel from the traditional whitewashed architecture we’re used to seeing in the Cyclades. Save this photo to your phone's camera roll to add this quote to your InstaStory. The tradition of Martis (derived from the Greek word for March) dates back to Ancient Greek times, as a way to usher in the transition from winter to spring. On March 1st, it is said that if you tie a bracelet of red and white string around your wrist, it will protect your cheeks from burning in the sun. The white string represents purity and the red for the color of sun kissed cheeks. Our Martis, made in Greece by Makris, is adorned with an evil eye bead to bring the wearer good luck. So you put the Martis on at the beginning of March, when do you take it off? The answer is that it is different throughout Greece. In some regions, they're taken off at the first sign of spring, once the first flowers begin to bloom or at the first sight of birds returning from their winter migration. They then tie them around the branch of a fruit tree for birds to use to help build their nests. In other parts of Greece, they wait until the end of May, when they're thrown into the fires used to burn the floral May wreaths that once adorned their homes and businesses. No matter how long you choose to wear your Martis, don’t forget your SPF at home. We are very excited to be adding some new items from Hermina Wristwear to our store today. Brands like this inspired us to create Hellenic Aesthetic. Their designs are always beautiful, on trend & carry a subtle nod to the past. To celebrate these new arrivals, we'd like to share a few of our favorite tips for layering necklaces. Have some gold chains lying around? Layering different chain lengths is a great way to highlight a favorite pendant. Here we paired the Méliès Moon Necklace from our store with the model's own 13 and 15 inch necklaces. Don't be afraid to mix silver and gold. An easy way to incorporate both is to wear a piece made with both metals. The Kion Column Necklace is adjustable in length (from 14 to 16 inches) and its gold chain and sterling silver pendant makes it a truly versatile piece. Keep it interesting by layering different shaped pendants together. Think of it as a way to show off a few of your favorite pieces. We paired the Méliès Moon Necklace together with the Small Kressida Pendant with multi-colored stones. Here is a compilation of some new and old favorites of ours in Mykonos. A place for celebrity sightings, luxurious accommodations and some of the hottest places to party in the entire world, it will always be a favorite island of ours. MyMykonos Hotel- Located directly above (and within walking distance to) Mykonos Town, this 3-star bohemian-style hotel is a fun choice for those who want to be closer to town. San Giorgio Mykonos - This 4-star adults only hotel is located near Paradise Beach and is perfect for those looking to indulge in Mykonos' party scene. Santa Marina, a Luxury Collection Resort- Our 5-star choice is near the ever-crowded Ornos Beach, but it's careful layout feels like a secluded oasis. Santa Marina also is home to the famous Buddha Beach Bar, which is definitely worth the visit for lunch or dinner if you need a break from traditional Greek cuisine. Nautilus- Mykonos Town- A favorite of ours for three years running for traditional Greek food. Skip the classic Greek village salad and opt for their Mykonos-grown tomatoes, ksinotiro cheese, fried capers and basil pesto salad. Interni- Mykonos Town- Fun party atmosphere and great food. Reserve a few days in advance. Scorpios- Agia Anna Beach- You may remember Scorpios from our post. Scorpios is also a great place for dinner, but be sure to make a reservation (reservations@scorpiosmykonos.com) prior to your arrival if you will be visiting during peak season. Marenga Milk Bar- MyMall Mykonos - For coffee and food on mornings if you need a break from your hotel breakfast, or for those of us can't go more than a week without avocado toast. Enny Monaco- Mykonos Town- Beautiful pop-up for the 2017 season selling high-end clothing and accessories. We hope to see them return in 2018. Apriati- Mykonos Town- Beautiful Greek-made fine jewelry for both men and women. We can't resist picking up a piece each time we're in Mykonos. They also have boutiques in Athens, Spetses, London and Paris. Rumor has it they will be coming to NYC in the near future. Dio Horia Art Gallery- Mykonos Town- Whether you're in the market for fine art or not, it's worth the stop to view their latest show. Nammos Village- Psarou Beach- the new multi-brand high-end shopping center is a great pit stop on your way in or out of Nammos Restaurant by the Sea. Scorpios got a new neighbor this summer, and it is an absolute must-see. Situated on Agia Anna Beach, SantAnna is an all-around great place to spend the day. If the crystal clear waters of the Aegean Sea aren't your thing, this property boasts Europe's largest beachfront pool to cool off in. Have your hotel call ahead to reserve lounge chairs, cabanas, and/or a table for lunch. Want more Mykonos? Check out our post on our favorite seaside hangouts here. Photos of the Parthenon from this vantage point are all over Instagram, but many times the exact location isn't tagged. Most people don't like to give away their social media secrets, but we aren't most people. This photo was taken at the rooftop bar of A for Athens Rooms and Apartments, in the center of Monastiraki Square and within walking distance from the Plaka. This is the perfect place to grab an afternoon coffee (or any drink of your choice) and snap a great pic for the 'gram. You can thank us later. Mykonos. Once you go, it's hard to imagine visiting Greece again without spending a few days here. Part of the magic of Mykonos is its many exclusive seaside hangouts. You can spend your entire day at any of these locations, from noon until the sun slips under the horizon. Here are a few of our favorites. Scorpios draws you in. You can spend your day here under a wooden cabana, but we prefer to come here to watch the sunset and dinner afterwards. A Scorpios sunset is something you just have to experience, the music, the people, the setting. Try their avocado tzatziki. It will change the way you look at tzatziki forever. Oh, Nammos. A place to see and be seen, a favorite of many celebrities and recently selected for Conde Nast Traveler's Gold List for 2017. We just love it. End of story. We loved Principote Panormos Mykonos so much that we went back multiple times. This new kid on the block had just officially opened a week before we visited in June of summer 2016. It's a good place to rent a lounge chair and hang out for the day. We will be back in Mykonos this July and can't wait to share new finds with you, and to revisit some of our old favorites. Follow our Instagram @hellenicaesthetic to come along on our summer adventure with us. The smell of the grill hits you from about a block away as you walk up to this picture perfect facade. Most of Mandolin's seating is outside, adding to the immersive almost-like-you're-in-Greece atmosphere. It is rare for a Greek restaurant in the United States to serve maroulosalata, but this very simple addition to Mandolin's menu may be one of the reasons that I love coming here so much. Some thinly cut romaine lettuce, dill, feta cheese, and extra virgin olive oil with a little bit of lemon juice or red wine vinegar create a light and refreshing balance of flavors. In my opinion, the authenticity of Mandolin comes from the simplicity of its food. Like you'd find at any taverna in Greece, they aren't trying to reinvent or elevate Greek cuisine into something that it is not. Each dish is made of wholesome and traditional ingredients that makes their food unassumingly good. Be sure to check out their selection of Greek and Turkish packaged foods and home goods before you leave. After your meal head to the newly developed Miami Design District for luxury shopping, just a few blocks away. Visiting the art galleries and shops of nearby Wynwood is another great way to spend your day. Not headed to Miami? You can also visit Mandolin at many Soho House locations around the world. It seems many eyes in the fashion industry have been on Greece for inspiration. Greek Brit Mary Katrantzou looked to her roots for her Spring 2017 Ready to Wear show, where black figure pottery and Minoan motifs juxtaposed psychedelic patterns. It was reported in February that the Italian fashion house Gucci had its eye on hosting a runway show on Acropolis Hill this June, which was unanimously denied by Greece’s Central Archaeological Council (KAS). You can view the entire Chanel Cruise 2018 collection here. With Coachella wrapping up last weekend, I can't help but be relieved that my Instagram feed will no longer be inundated with endless festival pictures. Maybe I'm just jealous because I didn't go? Who knows. One thing we can definitely look to attendees of this (probably) overhyped event is for outfit inspiration. The most surprising trend to emerge this year? Your Papou's Greek fisherman hat. That's right, everyone from Victoria's Secret models to some of my favorite fashion bloggers were wearing them. I decided to head to the LF Stores location in Boca Raton, Florida, to get my hands on one and not only did I find them, but to my delight they are actually made in Greece! I find it fascinating that something so commonplace and readily available in the Greek Islands has found its way into a chain of boutiques here in the USA. I have to admit though, this was not a trend I saw on the forecast, but it makes me so happy and I 100% endorse it. The promotion of Greek products (whether we sell that particular item or not) is what we're about here at Hellenic Aesthetic. Head to your closest LF to get the #HellenicAesthetic for $35 or you can purchase one here.